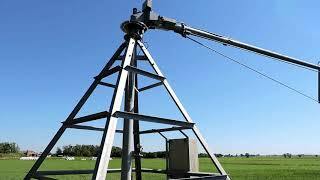 Pivot irrigation system was introduced on grasslands belonging to the farm. A drilled well (200 meters deep) was dug as a source of water for irrigation. Three machines are used to irrigate three separate grasslands that have different location, size and shape. The parameters of every rampe pivot irrigation are adopted to specific agricultural plots. 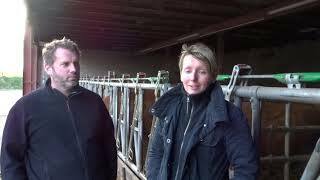 In Wadenoijen, Hielke and Hanny de Rooij run a dairy farm with 180 dairy cattle. 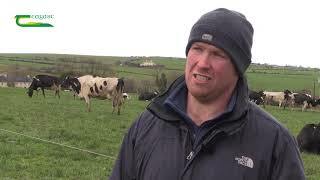 Through tight management it can reach 7 to 8 cows per hectare on the platform. 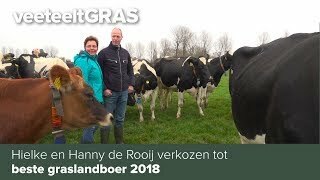 The use of rotating stand grazing is the best with the farmer and his resources. There was a relatively small platform for the number of cows. The grazing had to be efficient in order to ensure that all cows could be grazed. The construction of additional dams and cowtracks were important points of attention. Moreover, the farmer bought some new drinking troughs so every parcel has one own drinking trough. The cows are grazed in 5 plots of 4 hectares each. Every day the cows go into a new parcel. This is to keep the intake of pasture grass by the cow as constant as possible. The plots are mown separately from each other at a given moment. On the basis of the quality of the grass is determined from the disappearance in the rich owl of the cows of the young stock. Each plot is cut out twice a year. 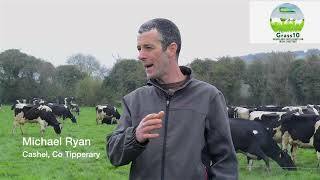 Last year the farm started grazing the milking cows on 27th of March. In total the cows have done over 200 days of grazing. 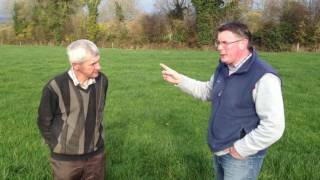 Why is spring grass important? Sowing grass and legumes seeds separately, perpendicular to each other in order to obtain uniform grass-legume sward. There is a high share of legumes in the sward, which amounts to 40% or even 50%. 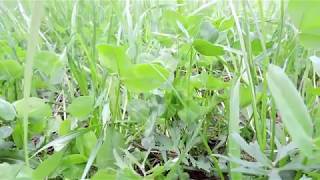 Sowing grasses and legumes together does not guarantee obtaining uniform grass-legume sward. Usually in Poland cows stay inside cowsheds all year around. 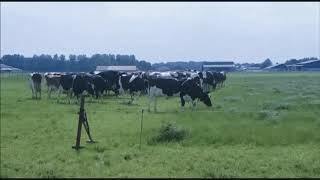 Presented farm, even with a large scale of production, applied grazing model for keeping and feeding cows. 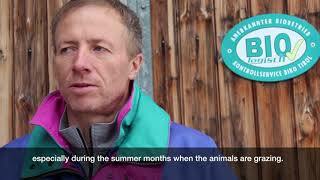 The organic farmer of the “Schornhof” keeps suckler cows and beef cattle of the races Grauvieh and Original Braunvieh on his dairy cattle farm since 2006. The cattle are kept on hay meadows and on ecologically valuable, extensive pastures without import of off-farm forage. 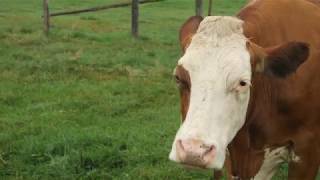 The practiced grazing management system is a flexible rotational stocking. The agricultural area of the farm is 50 ha, of which 24 ha are used for forage production, consisting of 11.4 ha leniently grazed larch pastures (no fertilisation additionally to the animal dung) and 12.6 ha grassland combining mowing (1-2 cuts) and grazing. The animals are grazing from the end of April until the middle/end of October. In this period, they do not receive any additional forage. In the winter months, they only get hay from the own meadows. Breeds suitable for a grazing management on moderately steep slopes are crossed with a beef breed for meat production. The meat of the 16 fattened oxes and -heifers is marketed under the regional label “BioBeef”. The marketing is done by the cooperative “Bioregio”, a group of 23 South Tyrolean organic mountain-farmers, conducting suckler cow keeping. The beef is slaughtered a6er 10-11 months by a butcher and divided up into mixed meat packages. The main customers of this packages are private persons, hosting companies and public facilities. The silage-free feeding with only hay is a mandatory criterion for the cooperative members. Aim of the barn hay drying is to produce the same amount of milk with 50% less concentrates (500kg instead of 1,000kg/cow). In addition to that, it is also intended to get 7 cents more per liter milk from cheese production factories. The barn hay drying enables to loose less matter on the field and to produce an en-hanced hay quality in opposition to hay dried on the field. This installation is working with a condenser which aim is to dry the air. This is done by cooling it down under the condensation point and warming it up again afterwards. The barn that was built is 60 m long, 22 m wide and is divided in 4 different compartments, each one 1400 m³ big.